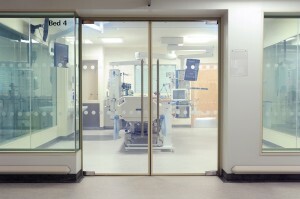 Smartglass was used to create a state-of-the-art partitioning system in the Integrated Critical Care Unit of the Royal Sunderland Hospital. Smartglass toughened panels were installed throughout the ICCU to provide an innovative and efficient solution to privacy and health concerns. 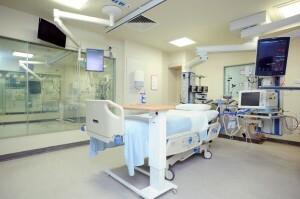 A recent American study by the Cleveland Veterans Affairs Medical Centre in Ohio found that curtains which hang between patients’ beds in hospitals can become contaminated with drug-resistant bacteria, such as C-Diff, MRSA and VRE. 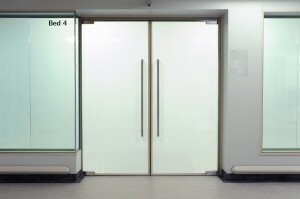 Smartglass panels combine a sheer and easily cleaned surface with the option of instant privacy should it be required. 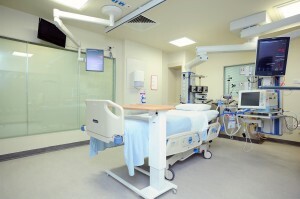 Smartglass provides the ideal surface to combat these deadly infections and eliminates the need for traditional blind systems which are difficult to clean and could harbour harmful bacteria. Smartglass is widely used within the hospitality, commercial and healthcare sectors as it illuminates environments, creating multi-functional spaces that adapt and respond to the needs of users at the flick of a switch. We also provide professional advice to clients to develop custom-built solutions to address various design challenges in their respective work environments. For us, design challenges are chances to adapt, innovate and create environments that surprise and inspire, both functionally and aesthetically. This entry was posted in Articles, Healthcare, Smart Glass News and tagged electric glass, electric privacy glass, Electronically Switchable Glass, Intelligent Glass, LC smartglass, Privacy Glass, smart glass, smartglass, SmartGlass International, switchable glass, switchable privacy glass. Bookmark the permalink.